COOKIN’ UP DISCRIMINATION? | McServed: Getting Served McDonalds Fast Food Funnies, Laughs and More! Please note: As an insurance measure due in part to a recent string of robberies, African-American customers are now required to pay an additional fee of $1.50 per transaction. Thank you for your cooperation. 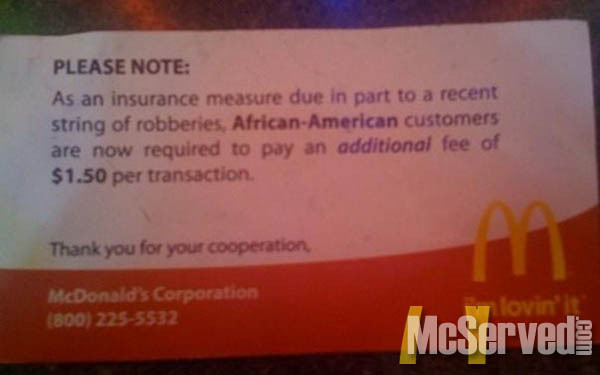 So…now we pay extra for the color of our skin?? Seriously McServed? It’s a hoax. Do your research first, plzkthnx. This was just on Yahoo!!! I don’t understand what kind of people actually believed there was truth to the photo. Does anyone honestly think that a company that influential and that affluent would risk their business on blatant racism? Also, may I please point out that the punctuation in the notice is not correct; it has misplaced commas and is lacking some proper punctuation? I would hope that, if McDonalds did post a notice like this, the company would be intelligent enough to use proper punctuation. When people believe everything they see online, however, minute details like these are simply overlooked. I came, I read this article, I coeqnerud.